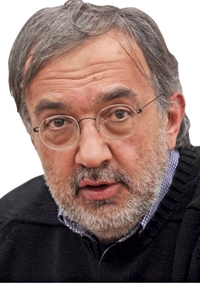 Sergio Marchionne, Chrysler-Fiat CEO: "We will continue to look at other bilateral arrangements. We're totally open." A Mazda-Fiat deal to develop a sporty roadster jointly helps Mazda Motor Corp. as it seeks global partners, but the scope of the project is so small that the Japanese carmaker still will need to collaborate more with Fiat or other carmakers. For Fiat Group, the deal confirms Chrysler-Fiat CEO Sergio Marchionne's willingness to work with other automakers for the sake of cutting costs. It also brings Fiat slightly closer to Mazda, a company that Marchionne has named as a potential partner as he seeks to raise volumes substantially. The roadster, to be based on the current Mazda MX-5 Miata, will be built starting in 2015 at Mazda's plant in Hiroshima, Japan. Mazda will sell it as the MX-5's successor, and the Fiat Group's Alfa Romeo brand will sell a version with distinct styling. The project will help loss-making Mazda eke extra volume from its beleaguered operations in Japan, which export nearly 80 percent of their output and are getting hammered by the yen's surge in value against the dollar and other foreign currencies. It also helps Mazda spread the cost of developing another niche vehicle that might be hard to finance as the company reels from four straight years of losses. The two companies also are discussing further cooperation in Europe. That is a plus for Mazda because Europe is its smallest market. For the full fiscal year that ended March 31, 2012, Mazda said, its sales in Europe fell 14 percent to 183,000 units. Earlier this year, Mazda President Takashi Yamanouchi pledged to seek alliance partners "actively." But both Mazda and Fiat downplay the possibility of a capital tie-up. Still, the agreement and subsequent comments by Marchionne leave the door open for closer cooperation. The day after unveiling the roadster project, Marchionne said he was open to expanding the partnership with Mazda and building the Japanese automaker's vehicles at Fiat and Chrysler Group factories worldwide, including in the United States. He also said Fiat is open to additional partnerships to help lower the automaker's costs and expand its global reach. "We will continue to look at other bilateral arrangements," Marchionne said. "We're totally open." Fiat already builds the Ka minicar for Ford Motor Co. in Poland alongside the Fiat 500. Fiat sources its Sedici small crossover from Suzuki Motor Corp. in Hungary, sharing the investment costs of around 1 billion euros (about $1.26 billion at current exchange rates) needed to develop each new car. "The economics make it very difficult" for most automakers to continue to produce all their own platforms and powertrains, Marchionne said during a visit to Chrysler's Belvidere, Illinois, assembly plant for the start of production of the Dodge Dart. "We're willing to engage in discussions with anyone else." The Fiat-Mazda alliance won't have a big immediate impact for either automaker because it will be years before the cars arrive in showrooms, Kohei Takahashi, an auto analyst for J.P. Morgan Securities Japan, wrote in a report after the deal. But it is a good first step. "We find it positive in qualitative terms that the alliance has taken on concrete form and might lead to expanded collaborations with Fiat in Europe and North America," Takahashi wrote. "We hope to see further growth in tie-ups to raise the operating rate in Japan and reduce currency exposure." "The mere fact that Fiat seems to be going down the aisle with Mazda in our view significantly reduces the probability of striking a deal with a potentially more attractive partner such as Suzuki," Patel wrote. "In contrast, Mazda itself brings little to the table [e.g. no sufficient China/India exposure, sub-scale in Europe and globally, lack of technological leadership] and Ford has been selling out partly because of this." Marchionne is on the prowl for additional partners, especially in Asia, to add to the Fiat-Chrysler alliance. He told reporters at the Geneva auto show in March that Mazda and Suzuki are prime candidates. He said there weren't many other possible and attractive partners left in Asia. Marchionne has said a mass-market automaker will need global sales of at least 6 million units to survive. Fiat and Chrysler Group together had 4.1 million in 2011. In calendar 2011, Mazda's global sales totaled 1.2 million, half of Suzuki's 2.5 million. Mazda has been independent since former partner Ford Motor, then seeking to raise cash to head off financial woes of its own, sold down its holdings in the Japanese automaker. Ford began to sell off its controlling 33 percent stake in Mazda in 2008. Today Ford owns about 2 percent of Mazda.